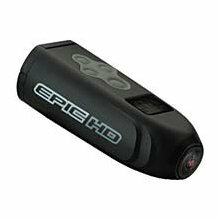 So I finally got my Epic HD helmet camera. I took it out skiing at Copper Ski Resort here in Colorado and it worked pretty well. It is lightweight, shoots HD video, takes still photos on a customized timer and can go anywhere thanks to an adhesive mount, a vented helmet mount and a jointed mount. It uses AAA Lithium batteries to power it and it takes a SD card up to 16GB. The camera shoots high definition video in 720p at 30 fps. It captures a faster sport like skiing pretty well and there is very little color distortion. I had the camera mounted onto my vented helmet with the provided strap and it worked well. The camera did not shake at all and the mount did not affect the footage. A fish-eye effect does happen every once in a while because of the wide angle the camera uses (120 degrees). This wide angle causes the camera to readjust to the changing dynamic of the environment more frequently because it is catching more information. It also has more of a bubble lens instead of it just being flat and this probably contributes to the overall distortion. It is a good and bad thing and I will be working with the settings to see if I can customize it. Check out the video after the break. The two key features of this camera is that it is extremely lightweight and pretty straight forward to use. There are only a few buttons on the camera and it allows you to choose video or still photos as well as look at the small LCD display to see what the settings are. The LCD screen is a very good feature of the camera and allows the user to make changes on the fly. While on the lift, in between runs, I could change from video to still photos to get the sequence shot I was looking for instead of video footage. Jeremiah, Austin and I had a great day and logged over 16,000 feet of vertical gain. Jeremiah ripped up the mountain on his Volkl Mantras and Austin was droppin' a knee on his Tele setup. For the first day of the season it was pretty good snow conditions and our legs were done by the time we were ready to hit the road. Overall the camera is great. It's lightweight, user friendly and it can mount almost anywhere. Feelin' the adventure blog. Keep it up. Amazing! Can't wait to get on the slopes now. Nate - Thanks a lot man. I have been building up some material and it should start flowing in soon. Ryann - I can't wait to get on the slopes with you!! !